In 3-quart saucepan, heat water, brown rice and wild rice to boiling . Reduce heat; cover and simmer 40 to 50 minutes or until rices are tender. If necessary, drain. Heat oven to 350°F. Spray 13x9-inch (3-quart) glass baking dish with cooking spray. In very large bowl, mix pasta sauce, sour cream, broth, Parmesan cheese, thyme and pepper until well mixed. 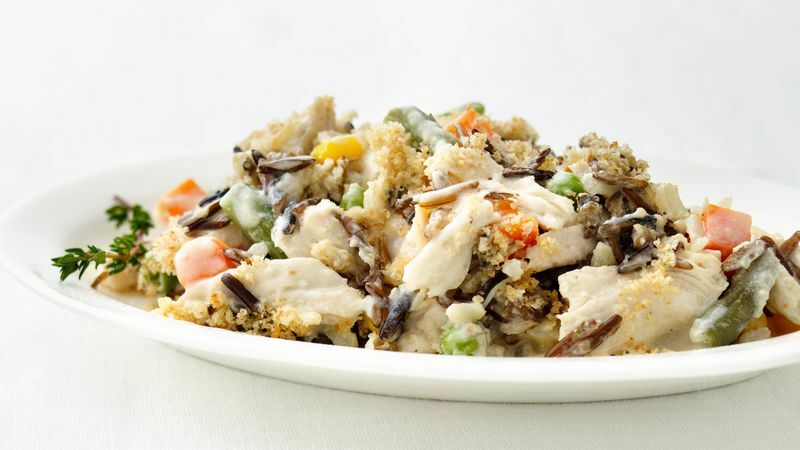 Stir in rice mixture, turkey and vegetables. Spoon into baking dish. In small bowl, mix bread crumbs and oil; sprinkle over turkey mixture. Bake uncovered 40 to 50 minutes or until edges are bubbly and bread crumbs are lightly browned. We like the combination of the two rices, but you can make it with all brown rice or all wild rice, if you prefer. You can use cooked chicken instead of the turkey, if you like. It's easy to make this casserole up to 8 hours in advance, simply cover and refrigerate without the topping. Then, sprinkle with the bread crumb mixture just before baking.